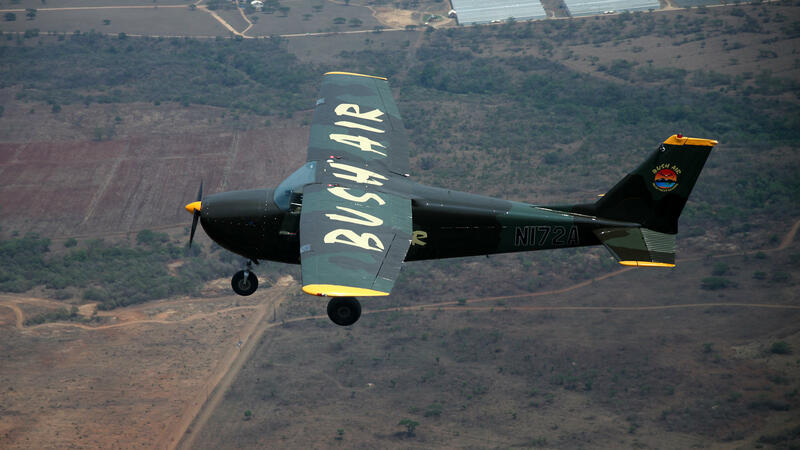 On 80 acres of land at the edge of Kruger National Park in South Africa, lies the operations base of Bush Air. Owner CC Pocock has carved out a 1,000-meter grass airstrip and built a two-story house with an attached hangar. Bush Air's main fleet consists of a single engine plane, a twin engine plane, and a taildragger. Bush Air offers advanced training in bush piloting to those aspiring to take on the challenges of extreme terr terrains, such as mountains and swamps. CC is up at 5 a.m. with his pilots starting on day one. He will begin training by flying up to 12 hours a day in all kinds of rough conditions, and over rough terrains. They'll practice quick decision-making techniques while flying at various altitudes, even when weather may be beating down on the plane's performance. Landings in rough terrains in remote parts with no strips are also common. While CC has taken on every type of job involving aviation or bush piloting, from cargo transport to relief missions to safari flights, the veteran Bush pilot has grown incredibly popular within the flying community for his ability to transform normally skilled pilots into bush piloting dynamos. Today, CC can't find the time to accept the offers he gets for random gigs because he has agreed to take on quite a number of pilots from all over the world who are wanting a piece of CC's piloting wisdom. CC now has three-day to seven-day intensives, training pilots to be the best they can. Bush Air must always be alert to both threats on the ground in the sky. Competitors are always attempting to box him out, while local interests can become threatening at nearly any time. CC must remain vigilant for his own safety and for the safety of his trainees. One wrong move and his name, business, and life may all be in danger. CC's business, home, hangar, planes, and even accommodations for staff and trainees are all together on the property. Aside from being in the air, CC is most at ease in the kitchen, and is always preparing meals for his team. He reserves the last day of training for a graduation party. Greenhorns come to Bush Air to learn for a variety of reasons and from various backgrounds. Motivations include commercial pilots wanting to strengthen their aviation muscles to relief mission workers needing to learn how to safely reach those who need their help. Very few pilots have the experience or natural skill it takes to succeed in the bush, meaning only 30 percent of those who attempt it as a career will make it.